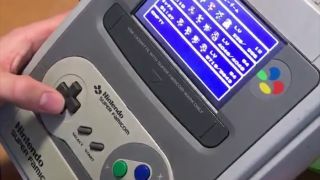 While the gaming world at large is buzzing with the launch of the Nintendo Switch this weekend, an enterprising modder has added portability to one of the gaming giant's classic consoles of the past. A Twitter user going by the handle @huxarufaxara has put together an ingenious mod of the Super Nintendo Entertainment System (SNES), or Super Famicom as it was known in Japan, turning it into a portable contraption you can hold in your hands. There's a controller and LCD screen embedded into the unit, as well as a custom-made cartridge slot for loading all your vintage games (this was a long time before eShops on the internet, remember). The controller's shoulder buttons have been moved to the sides. The console has integrated speakers as well as an embedded screen, enabling you to enjoy all that 16-bit audio without having to connect anything external to it. Whether or not you can connect up another pad for two-player gaming we're not quite sure. It's also not immediately apparent whether this retro gadget is actually running off an adapted battery pack or whether it's plugged into the mains, but even if it's not a fully portable system, we have to say maximum kudos to the modder behind it. Perhaps if you're waiting for more games to arrive on the Nintendo Switch you could put together something like this for yourself in the meantime - although instructions aren't provided. Hundreds of games were eventually released for the SNES.